How would you like to gain channel subscribers and increase engagement with your online videos? You can do that with a simple YouTube hack. Even better; you don’t have to do anything really technical. All you need to do is make use of a simple feature offered by YouTube. It only takes a few minutes to set up. There are even ways to configure it so that you can put it on autopilot. You can also adapt the hack to each video you upload. You might have seen the hack on other videos you’ve watched online. At the end, YouTube shows an “end screen” that offers a bit of marketing. That end screen appears during the last 5-20 seconds of the video. It can show as many as four elements. What are “elements”? They’re clickable widgets that you use for shameless self-promotion. They make it easy to keep people engaged with your brand. Here you can see the one we have added. Since adding this, we have received thousands of new subscribers who now leave more comments. This YouTube hack isn’t available to just any YouTube creator. You have to be a member of the YouTube Partner Program to qualify. As of this writing, the requirements to join the partner program have just changed. Now, a channel has to reach 4,000 watch hours in the previous 12 months and 1,000 subscribers before it’s eligible. Check out the YouTube Partner Program FAQ for more info. If you haven’t yet achieved those milestones, you’ll have to look at other ways to promote your videos before you can use this YouTube hack. Even if your channel qualifies for end screens, that doesn’t mean that all of your videos qualify for them. To prevent a hostile user experience, YouTube prohibits you from adding end screens to videos that use annotations. If you do try to add an end screen to a video with annotations, YouTube will inform you that you need to delete the annotations first. You can delete them with just a couple of clicks. 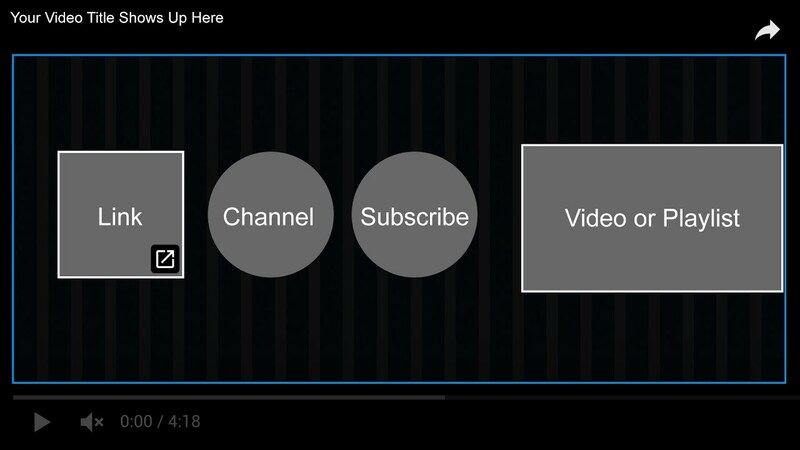 Here are step-by-step instructions to add an end screen to one of your YouTube videos. Click on your account icon in the top, right-hand corner. Select “Creator Studio” from the drop-down menu that appears. Click on “Videos” in the drop-down menu that appears. On the main screen, you’ll see a vertical list of your videos. Scroll to the video you want and click the “Edit” button. On the top tab bar, click “End Screen & Annotations.” If this is your first time doing this, you’ll likely see a popup that tells you a little bit about end screens. Just click the “Got It” button in the lower, right-hand corner. If you have annotations on the video, YouTube will tell you that end screens don’t work with annotations. Click the “Delete Annotations” button and select “Delete” on the confirmation box that appears. Now, you should be looking at your video with a big, blue “Add Element” button on the right-hand side. Click that button. Once you’ve selected your element (and specified related info), you’ll see it on top of your video. That’s how your viewers will see it as well. Keep in mind: you can move your element around. Just hover over it, click on it, and drag it to any part of the screen where you’d like it to appear. Add any additional elements you want to put on the screen by clicking the “Add Element” button. Remember, you’re limited to a maximum of 4 elements. When you’re done, click the “Save” button in the upper, right-hand corner. There are also a couple of additional options you can use when creating an end screen. The “View” button will help you with the layout. For example, you can use it to show or hide a grid. Click “Use template…” if you want to format your elements according to one of YouTube’s predefined layouts. You can see the layouts by clicking on the button. Finally, click “Import from video” if you’d like to import an end screen from another video. That will save you some time so you don’t have to duplicate your efforts. You’ve worked hard to build your brand online. Why not give your YouTube channel a custom URL? Learn more about setting up a custom URL in advanced settings. Need some great background music for your next video? If so, look no further than YouTube’s audio library. It’s packed with quality tunes. In fact, you can even filter the library by genre and mood. That way, you can set the right kind of tone (literally) for your next production. All the tracks are royalty-free. That means you can use them in your videos without worrying about copyright issues. Did you know it’s a breeze to convert any YouTube video to an animated GIF? You can do that over at gifs.com. Just head over to that website and paste in the URL of the video you’d like to convert. Then, start editing it for time and content. You can even add captions and stickers. Include animated GIFs in your content to add reactions and break up the monotony of plain text. Did you know that you can view a transcript of just about any video? Just go to YouTube and play a video with dialog. Then, click on the ellipsis (or “More” link) below the video title. It’s usually in the same vicinity as the “Share” link. In the pop-up menu that appears, click on “Open Transcript”. If you’re on a desktop platform, you’ll see the transcript, complete with timestamps, slightly to the right of the video. Keep in mind, YouTube transcripts are often auto-generated, so they might not be perfect. Also, you might not see the option to open the transcript if the publisher, for whatever reason, chose to hide it for that video. There’s an easy way to find popular YouTube search terms over time with Google Trends. Just head over to Google Trends and plug a search term into the “Explore topics” bar at the top. Then, hit Enter. On the next page, you’ll see a graph that shows you the popularity of the search term for the entire web during the past year. Above that graph, you should see a drop down menu with “Web Search” as the default selection. Click the down arrow on that menu item. Next, click on “YouTube Search” at the bottom of the drop-down menu that appears. The new graph you see will show you the relative popularity of the search term on YouTube over the past year. Keep in mind: those numbers on the graph are percentages. A value of 100 represents peak popularity for the search term. All other numbers are relative to that popularity point. 1. Is There a YouTube Hack to Link to a Specific Point in a Video? If you’d like to link to a specific spot in a video, YouTube allows you to do that. Go to the video, pause it where you want the link to start, and click the Share button. When the popup appears, select the “Start At” checkbox at the bottom. Then, you can set the time to where you want it to start. Note that, by default, the time is set where you paused the video. You shouldn’t need to enter anything. Finally, click COPY to put the video link in your clipboard. Then, paste that link wherever you want. 2. Is There a YouTube Hack to Schedule a Video for Posting Later? Yes. YouTube allows you to schedule a video publish time. Alternatively, you can also enlist the assistance of a social media management tool to do that. Check out Hootsuite, for example. Although the name implies that it’s designed for Twitter, you can also use it to manage other social media channels, including YouTube. Hootsuite enables you to upload a video and save it for later publishing. The company has a video on the subject if you’d like to learn more. 3. Is There a YouTube Hack to Download Videos? If you want to download YouTube videos, you have a couple of options. One way is to familiarize yourself with the YouTube API. Then, use that API to pull down videos hosted on YouTube. Of course, that’s not an option if you don’t know anything about software development. The other way to download videos is with the aid of a tool. While there are plenty of tools available, one of the most popular is Free YouTube Downloader. As the name implies, it won’t cost you anything. Unfortunately, you’ll need to install software on your PC if you want to use Free YouTube Downloader. If you’re looking for a cloud-based solution, check out OnlineVideoConverter.com. 4. Is There a YouTube Hack on Commenting? Remember, YouTube is part of social media. It’s important that you leverage that “social” part of social media and engage with your audience. You can do that in the comments section. Be the first to post a comment on your own video. Reply to comments from other YouTube users. Generate some conversation about your content. That will boost your engagements and keep people on your channel. 5. Why Is Creating a Playlist Considered a YouTube Hack? Remember: when people search on YouTube, they won’t just find videos, they’ll also see playlists in the results as well. If you don’t believe me, just search for “1980s music” on YouTube. You’ll see plenty of playlists in the search results. Bottom line: you can get discovered by creating playlists. Just make sure they’re optimized for keywords that are relevant to people in your target market. 6. Is There a YouTube Hack for Finding Keywords? Remember, Google owns YouTube. So if something is trending on Google, chances are pretty good that it’s trending on YouTube as well. Also, YouTube is the second most popular search engine in the world behind its parent. So you should treat it like a search engine and optimize your videos for keywords. If you have the cash, consider investing in a keyword research tool like Ahrefs. Google Trends is free, though. Congratulations! You’ve added the #1 YouTube hack to your own video! Going forward, think about how you can use end screens to best promote your brand. For example, you might find that linking to related videos is better than linking to your website. Fortunately, you can determine that by looking at your analytics. From the Creator Studio menu, just click on “End screens” under “YouTube Analytics.” Check to see which types of elements get the most clicks.